Ok, so South Korea was eliminated in the first round but to me, I felt that it was a better showing than their 4th placing back in 2002. Yes, you heard me right, South Korea's 2006 first round elimination is better than 2002's 4th placing. With better experience in the World Cup competitions and more players playing top-tier football in Europe, I have to say that the South Korean team this year played better then in the last world cup. The 4th placing in the last world cup was achieved without pride as a result of dodgy refereeing not only in the game against Italy but again against Spain. Had the refereeing not favoured (unintentionally or otherwise) the 2002 South Korean team, they would have been eliminated right there and then in the second round. Still, like they say, the ball is round. Anything can happen. And this very much applies to last night's match where the Swiss disposed off the South Koreans en route to the second round. The circumstances under which Switzerland scored the second goal was unfortunate. It was a linesman mistake which cost the Koreans the goal. Some may say that even if the goal was disallowed, the Swiss would still have won on the 1-0 scoreline. So in a way, South Korea lost the game to bad refereeing. Fate paying them back for the 2002 debt? Karma? Perhaps, perhaps, perhaps. Still, it was a commendable effort for the South Koreans who played with more heart than their pathetic Japanese counterpart. To that, I congratulate the South Koreans for a good showing. See you next world cup. Good luck. 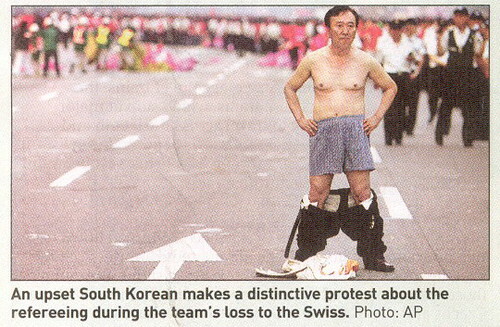 * With France beating Togo 2-0, a Swiss-South Korean draw would still eliminate the latter. Hence when Switzerland goes 2-UP, South Korea needs to score 3 since only a victory would get them through. yay to switzerland! hehe.. sorry I'm swiss supporter! Don't poke me.. Agreed. They did better than their 2002. It's really a pity they didn't get in to top 8. I was hoping they did, 'cuz I really think they were great this year. better than the japs. -_-"
heather: No need to sorry lah. Nothing wrong with supporting your own favourite team.